Empties #1 - Cherry Colors - Cosmetics Heaven! I was asked to do this new series on my blog, because obviously everyone loves to read about them. Yes, even me. So thank you for this suggestion. The only part of this new series is me hoarding used up items. It sends me a bit on a guilt trip because there's no way for me to use all the stuff I have as quickly as I'd like to. But okay, lets begin with the first part of many to come, empties. Essence nail polish remover - Summer edition - Well, to be honest I didn't like the scent too much. Too intense, too fake, to blah. It did an OK job at removing nail polish, but nothing too good. Would repurchase? No. Essence nail polish remover- coconut and papaya - I like this remover better than the Summer edition. Better scent and a better job at removing nail polish. Pretty good! Would repurchase? Yes. 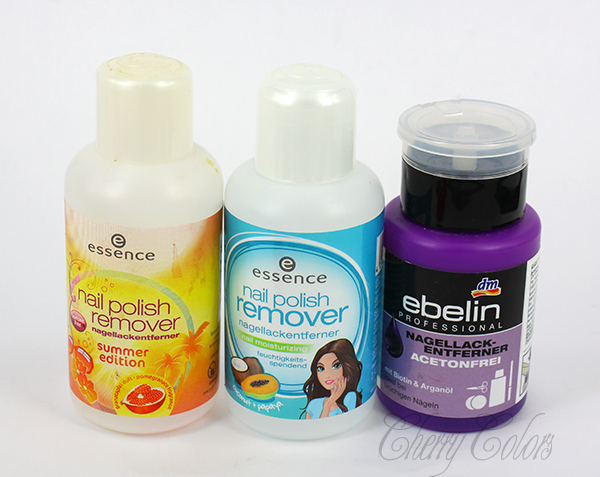 Ebelin nail polish remover - I really like the dispenser. It is very practical and clean. I did reuse the bottle once it got empty. Does a good job at removing nail polish (also glitters!) and has a mild scent. Would repurchase? Yes! 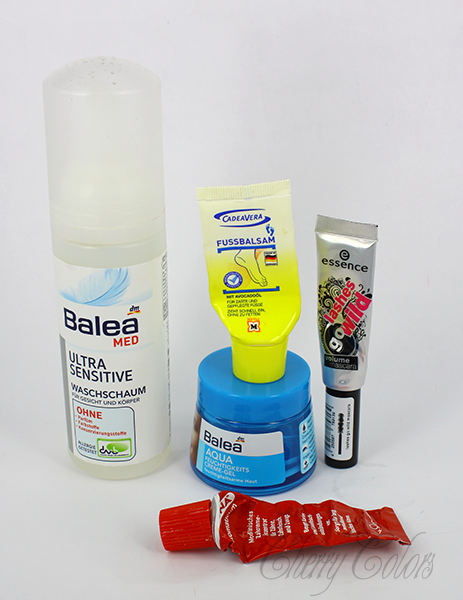 Balea MED ultra sensitive cleansing foam - A nice foam, that has practically no scent (thus it being for sensitive skin). It does its job OK, except for the eye make up. And here I have in mind the mascara. Nightmare! It needs to pair with another make up remover and then it's all good. Would repurchase? Maybe! Cadeavera foot balsam - You actually need just a tiny bit to make a huge difference. Smells good and applies nicely. This stuff is sent from gods! Would repurchase? Yes! Balea Aqua daily face cream - A simple cream that doesn't irritate or make even oiler my T-zone. Also very comfortable on my dry cheeks. It's lovely and cheap. Would repurchase? Yes! Essence Lashes go wild mascara - One of the best mascaras I've tried lately. Sadly it dried up quite quickly :(. It did make my lashes loooong and natural looking, and if I applied more they were wild, wild! Would repurchase? Yes! Ajona tooth paste - An amazing tooth paste concentrate that works miracles. It cleans my teeth so well, that I am never going back to a different brand. I also think it has some whitening quality, because my teeth surely look whiter! It also has a bit of a stink to it and a gentle minty flavour (nothing that burns like a motherf...). Would repurchase? Yes! 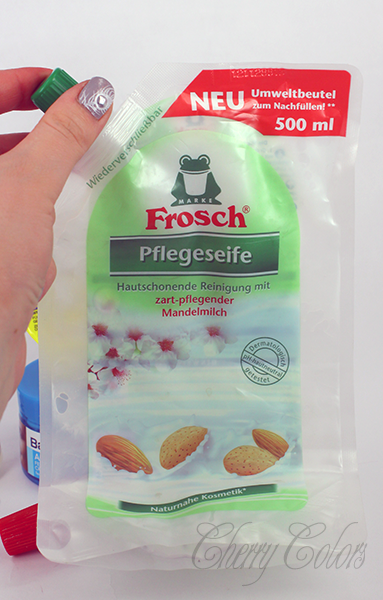 Frosch handsoap in mandel - An OK soap. I like the refiller baggies things. They are so much more convenient and I don't have to buy another dispenser after the first one. I liked the sensitive version better, this one dries my hands if I wash them two times in a row. Would repurchase? Only if I wouldn't find anything better. So, this is the end of the first part of Empties. Please do let me know what do you think and how can I improve such posts.